This commercial tells a version of the story of the famous Christmas Truce of 1914, an incredible event that I've written about before. However, the ad has apparently stirred up a lot of anger and indignation, particularly among those who are disturbed at the retail giant's plans to destroy a WWI memorial in Bristol. I've learned that the city's memorial football stadium, an historic tribute to the First World War, is now the target of a massive redevelopment plan by none other than Sainsbury's. Naturally, the controversy over the expansion of big box stores and their associated projects is nothing unusual here in the U.S. The progression of giant concrete buildings, with their miles of dreary aisles lit by gloomy flourescent beams, is a disturbing trend. Open spaces and small family-owned businesses are often at risk. Here, though, many of the emotions stirred by this commercial and its maker are centered not only around an historic site, but around the rightful ownership of what it commemorates. Sainsbury's, in issuing this ad, is felt to stake some claim on First World War memory or history--and especially to presume to tell a story that many feel is near-sacred. To make this claim more upsetting, the business's destructive plans for the Bristol site make it obvious that preserving that memory or history is not a primary concern. To complicate matters, the ad is a product of a partnership between Sainsbury's and The British Legion, an eminent UK armed forces charity. The Independent: "Hypocritical Sainsbury's Ad..."
"On Advertising, Chocolate, and the First World War"
Though some, including Ally Fogg at The Guardian, say that the advertisement is mostly disturbing not because of the stadium controversy but because it is a commercialized and unrealistic portrait of WWI experience, it is important to recall at least that the Truce really did happen. In fact, I would argue that it is essential to remember that it happened and was documented. It is part of the British (and German) WWI experience, though it is of course not reflective of the larger reality of a soldier's existence in the trenches and in battle. That it seems such an unbelievable phenomenon makes it all the more worth our attention, because it makes the tragedies of the rest of the Great War all the more poignant. I am not in favor of the commercialization of this story. I wish the advertisement could have been some kind of short film, issued in honor of the centenary of this extraordinary event and not linked to any commercial entity. It is worth such remembrance. I respect and sympathize with the anger that the ad has generated among those who do not wish to see the Bristol stadium torn down, and for that reason, I respect the feelings of those who would rather that Sainsbury's had never made a commercial telling a First World War story. What I hope, though, is that this commercial and its controversy help the WWI history community to grow, and for more people to be inspired to learn about the ghosts of 1914. A brief post today to honor Remembrance Day/Veteran's Day. THANK YOU all service members, past and present. I've been so impressed with the poppy installation at the Tower of London, honoring those who gave their lives in the Great War. Let us give equal thanks, attention, and care to living veterans. As I have done in years past, I urge you to donate time and/or funds to supporting service people who need our help. Though I am not affiliated with it, I can recommend The Intrepid Fallen Heroes Fund, for a start. I will close here, with links to past posts about Remembrance Day and resources for giving. As this August 1914 front page (courtesy of the fascinating British Newspaper Archive's post on WWI Headlines) proclaims, Britain entered the First World War on 4 August, 1914. Earlier on the same day, Germany declared war on Belgium after the latter had attempted to remain a neutral territory. In consequence, Britain declared war on Germany late that evening. By this point, the two sides of the terrible conflict had been mustered: the Allies, which comprised Britain, France, and Russia; and the Central Powers, which included Germany and Austria-Hungary. 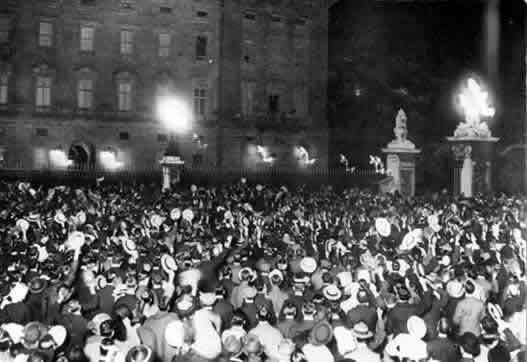 A massive crowd of Londoners cheered the news of the war that night. The next morning, we might assume, many of these ghosts of 1914 opened a newspaper to take in the momentous occasion. 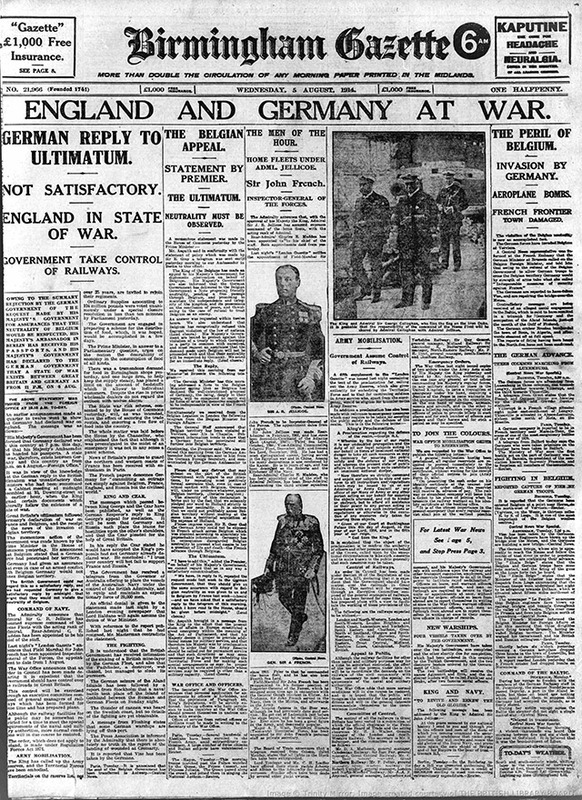 We can read the 5 August 1914 edition of The Daily Telegraph along with some of them, thanks to the The Telegraph's wonderful online WWI newspaper resource. 4 August 1914. © National Archives, UK. Civilian Britons reading of their nation's entry into war were met, perhaps strangely, with a distinctly non-wartime assortment of peppy advertisements for hair products, laxatives, and vacations to Spain. Such newsprint chatter vied for space with maps of the conflict and reports of the official declaration, though. Already, some panic over war's consequences for civilian life are apparent, as one article details "Civic Cowardice" in the form of "housewives" whose frenzied stocking up on food items was already creating high prices and low supplies (p. 10). Another article insists, however, that supplies of meat and grains are plentiful (p. 9). Poignantly, an eye-catching notice reminds young unmarried men that "Your King and Country Need You!". Its insistence that "each day is fraught with the gravest possibilities" and its portrayal of the Empire as being "on the brink of the greatest war in the history of the world" are both chillingly accurate and already out-of-date. Clearly written before the awful certainty of this particular day's news, the Army notice reminds us that the gravest of possibilities for Britain in 1914 had come true. From The Telegraph: "First World War Centenary: how events unfolded on August 1 1914"
One hundred years ago today: Germany declares war on Russia, 1 August 1914--a date recognized as the official start of the First World War. Than these to which the Tale, indulgent Friend! Would now direct thy notice. It's somewhat strange, waiting with bated breath for the steady gears of history to make their circuit towards the date when we can look back exactly one hundred years to the start of the Great War. It's as though we anticipate some kind of perspicuity that, like gazing down into a glass-clear lake, is only possible when the present aligns with the past just so. Like Wordsworth's boy looking down into the "still water" and confused by the reflections therein of sky and earth and of "his own image", though, perhaps we may find (and perhaps we already know) that shadow and substance cannot be so easily separated. Though the great span of time that a centennial marks might suggest a certain poignant stillness, calming the past into clarity and granting us objective distance, our own image may surprise us in those depths. What might we learn about ourselves and our world by looking for and listening to those ghosts of 1914? As we have for some time now on this blog, we shall continue ask to this very question. We will continue to chase shadow and substance in the (deceptively) glassy deep of hundred-year-old history. As we near and enter the official centenary, it is my aim to direct the blog towards following events of the war's unfolding over the years 1914-1918. The Telegraph: "WWI: 7 Days to Go"
New York Times Learning Network: On this Day...(Reprint of 1914 article: "Austria Formally Declares War on Servia..."
And a last-but-not-least suggestion: hstry.org's fascinating "Back to the Mud" blog series on one man's adventure through family WWI history. Austro-Hungarian Archduke Franz Ferdinand and his wife Sophie leave Sarajevo City Hall on June 28, 1914. Today marks the 100th anniversary of the assassination of Archduke Franz Ferdinand, on June 28 1914, in Sarajevo. This was the day, a century ago, when the world began hurtling towards the Great War. Though the conflict would not begin officially until August, we might say that the Archduke and his wife, Sophie, were the first Ghosts of 1914. There is also news of the centenary observations, some of which have provoked serious controversy due to the persistent instability that WWI brought to Eastern Europe. The Telegraph: What if Archduke Franz Ferdinand had Lived? Richard Lebow: The Archduke Lives! 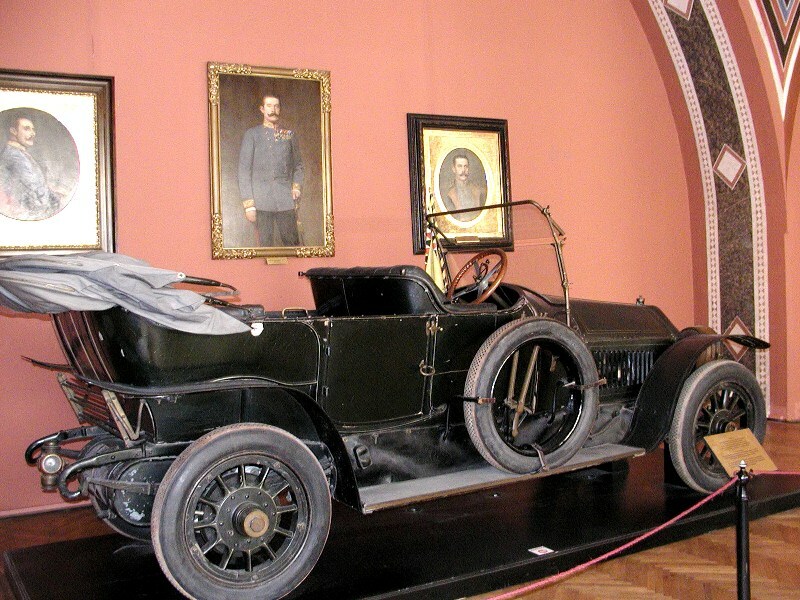 1911 Gräf & Stift open car in which Archduke Ferdinand was killed. Military History Museum in Vienna, Austria. There is something so compelling about asking what our world would be like if, at the conclusion of that day in Sarajevo, the car bearing the Archduke and his party had simply returned to the train station in Sarajevo and nothing more of deep significance had been recorded. We'd like to think that the millions of Great War casualties would never have happened, that so many lives cut short or harmed by the four years of strife and its aftermath could have remained untouched, undisturbed, and that a gentler course of history might have run peacefully through the first decades of the twentieth century. Perhaps this could have happened. But I think the most useful aspect of such dreams of a peaceful 1914-1918 is the waking from them, with eyes open to modern conflict and searching for the way to peace. 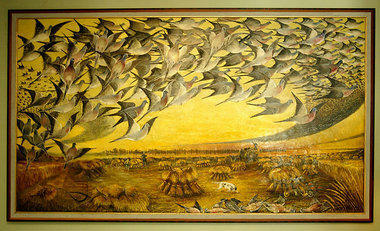 Carrier Pigeons and Tweeting: oh, what a digital war! 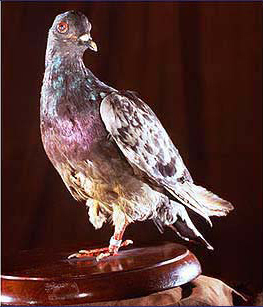 Cher Ami, an heroic U.S. Army Signal Corps carrier pigeon. I have a feeling that our Ghosts of 1914 would not be so taken aback to find that, as we approach the centennial anniversary of the Great War's start, our relationship to the war can now be (and may be primarily) digitally mediated. 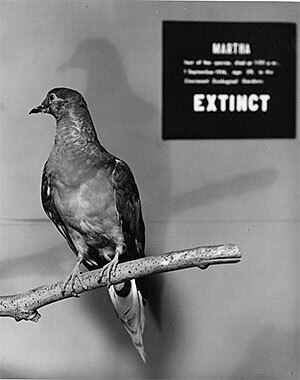 We've gone from carrier pigeons, like the brave and beautiful Cher Ami, who risked HER life to save hundreds of soldiers (and whom I saw on display at the Smithsonian Museum of American History on a recent jaunt to Washington DC), to Twitter. The other day, it struck me that this is probably the first war, and certainly the first major global conflict, whose one hundredth anniversary could become so digital. As 1914-1918's digital renaissance takes on further zeroes and ones, it is fitting, I think, to consider the novel technological ways in which we can invite the Ghosts of 1914 to become part of our lives--our awareness, our everyday existence. hstry: Franz Ferdinand's Assasination Relived on Twitter! What's more, hstry's blog will be featuring stories from a journey through WWI family history. Stay tuned for that! 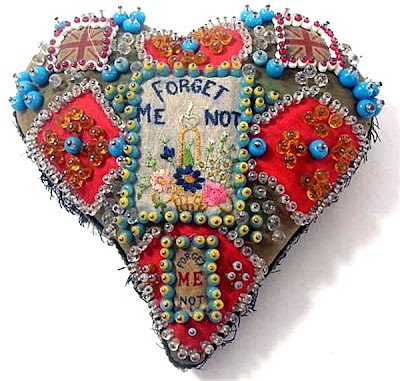 "Forget Me Not" WWI decorated needlepoint token. Image from: Needleprint, May 2010. Happy Valentine's Day to you, dear readers! I wish you a day on which you feel assured or simply hopeful about love's presence and power in your own life and in a global sense too. In honor of this holiday, I might direct you to past posts about chocolate and Valentine's postcards or sweetheart brooches. Today, I'll add to this little collection of sweet treasures a couple of film snippets found in the IWM's online collections. They capture a few moments of WWI-era weddings, whether that of a Canadian officer at St. James's church, Picadilly or that of the 1916 wedding of Field Marshal French's son. I can't seem to upload thumbnails of the videos here, but click on the links and watch, and then come back! In the first film's case, the bride and groom emerge on the church steps after their ceremony. It is fascinating to notice that, in this early era of "moving pictures," the happy couple and their wedding party are at first quite static, posing for photographs. Then, perhaps prompted by the man behind the movie camera, they launch into (somewhat self-conscious looking) motion, talking and interacting with the flower girls and bridesmaids who hold giant baskets of posies. Clearly, these pleasantries are staged, with darting glances at the cameras indicating the couples' awareness of being on film. The second wedding is a portion of WWI-era newsreel, only the opening act in a set of footage that includes military operations and geographical documentary. The couple in question, the Honorable John R. L. French and his wife, Olivia, whisk past the cameras in the first few seconds of the reel. He wears his uniform and she is clothed in a veritable cloud of white, veils and dress sailing across the frame and into their car. Lest we feel denied more of an onlooker's pleasure in the happy occasion, we are next presented with a sequence filmed at the groom's family home. We see the newlyweds strolling in the garden with John's mother. While Mr. French looks rather serious and tends to avert his gaze, the new Mrs. French smiles blithely and moves with quite impressive ease in front of the mechanical eye of the camera. Ultimately, they play with pets and walk confidently towards us down a beautiful tree-lined path, as though the stars of a feature film marching right up to the celluloid boundary that separates the viewer's world and theirs. "We're off to see the Wizard!" © Warner Brothers, image from "I Heart the Talkies." If the last seconds of the wedding film remind us of something like the above famous film scenes, it is only because of our post-1939 perspective, of course. And yet, by the 1910s, film acting was its own art, and viewers understood a range of tropes as conveyed in this medium (such a topic deserves its own post). Suffice it to say that the happy couple in the French wedding footage, as they walk down that path along with the elder Mrs. French, appear confident, energetic, and perhaps relieved that their time on film is coming to a close. Weddings on film, as the two WWI-era examples show us, were the modern way to publicize society marriages, something which, in one form or another, was nothing new. And yet, the dynamic sight of a bride sweeping down the church steps all in white or a happy couple together, enjoying the greenery and simple pleasures of a garden, was no doubt a thrill and an encouragement to this particular era's viewers. Other war footage was not far behind (and in fact was joined to the French wedding scenes as part of a larger news program). Thus, these fleeting glimpses of post-ceremony smiles or the swish of veils and skirts would have linked an often tense and unpredictable wartime moment with farther-reaching eras, traditions, and celebrations. Life did go on, and weddings and wartime were not mutually exclusive. I realize that this post has taken a somewhat serious tack, though Valentine's Day is not usually the most serious holiday in the calendar. But amid all of the candy, cards, gifts, phone calls, joys, and disappointments that this day can bring in all its many forms, these bits of filmic ephemera show us that love conquers all. Greetings and a happy new year to you, Readers! I've just returned from a birthday trip to Los Angeles and am here to share with you this timely and amusing poster marking a "Burns' Birthday" celebration held at London's Royal Albert Hall on January 23, 1915. Today's treasure (from the IWM's archives) promises a "Grand Scotch Festival and Patriotic Concert" to support the Belgian Relief fund. It is interesting to note that the 18th century Scottish poet's honorary festival was linked in such a fashion to the modern conflict, still new in early 1915. That the event was held in one of the most recognizable of London's Victorian landmarks bridges the space in between, making the concert a connector of three centuries. So let God be thanked. This prayer, if said at the 1915 occasion, would have been particularly apt, considering the event's goal of raising money for the Belgian Relief Fund. In 1915, rationing had not yet begun in the United Kingdom (it would not start until 1917), so we might assume that most attendees would not be noticing food shortages. The international Commission for Relief in Belgium, however, was focused on severe food shortages that hit the Belgian populace after the German invasion of 1914. Based in London, it was headed by future U.S. President Herbert Hoover. Financial support from donors enabled the complicated political, diplomatic, and logistical work of the CRB. Ultimately, the commission was able to organize shipments of millions of pounds of food to Belgium over the war years. Embellished flour sack, 1915 © Hoover Presidential Archives, Item 64.2.202. The Hoover archive holds an extraordinary collection of these flour sacks, with useful information on this unusual aspect of WWI material culture. Heading back to the Burns' day festivities at the Royal Albert Hall in 1915, it seems a remarkable affair, with as much pomp and circumstance as could be mustered to honor the Scottish poet and to support Belgian citizens. Though traditional Burns day activities are rather light-hearted, including dancing and the toasting of a haggis with Burns's poem, "Address to a Haggis", the levity of this particular day's music and other aspects would have been tempered with the gravity of purpose and patriotism. I don't have more information on the performers and groups listed on the poster. I'd like to poke around in the archives and elsewhere online to find out more and, if successful, will post the results! And with that, we'll sign off and wish you a happy new year and a happy Burns day, should you be celebrating!